Oh, the plight of a Texas child who yearns for snow. It’s tough to live out winter days in shorts and flip-flops when one dreams of scarves, and gloves, frosty temps and snowball fights. Admittedly, it’s tough as an adult who longs for the same thing! 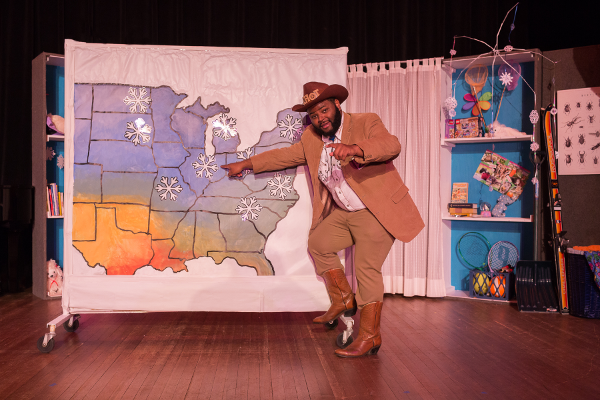 With my 8-year old daughter in tow, we headed to the Austin Scottish Rite Theater on opening day to see A Long Winter’s Night (in Texas), a Texas-tale about a girl named Suzi who lives in Austin and longs to see snow for the very first time. 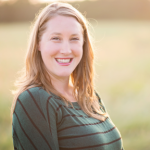 Suzi meets a new neighbor who has recently moved from New York to live in a warmer climate. Her neighbor is getting rid of her winter gear and kindly gives Suzi skis, snow boots and a box of winter clothes. It’s the evening of Winter Solstice, and Suzi dreams up a cast of characters that includes a special penguin who offers to take her along on his journey to Antarctica, Old Lady Winter who threatens to bring a blizzard to Austin, and a special visit from the very lovable weatherman from KHOT 24. 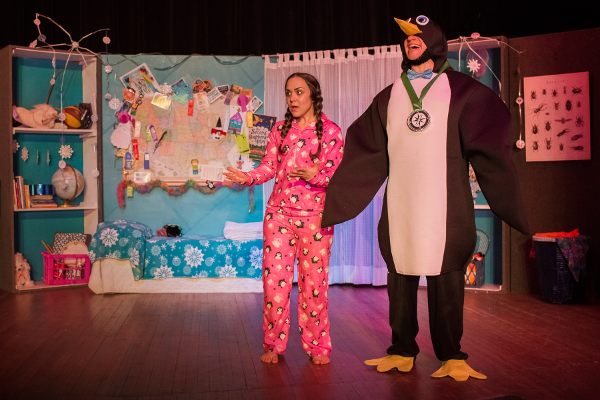 It’s an action packed night for Suzi as she has to pass a timed winter dress test (that part of the musical makes me appreciate my Austin winter wardrobe) and make a quick decision on whether or not she will travel with Pango the Tangoing Penguin on his journey to Antarctica. Suzi wakes the next morning to find that her dad has thrown her a surprise Snow Party. But with a special delivery waiting on her doorstep, she’ll be left to wonder if she really was dreaming the night before. 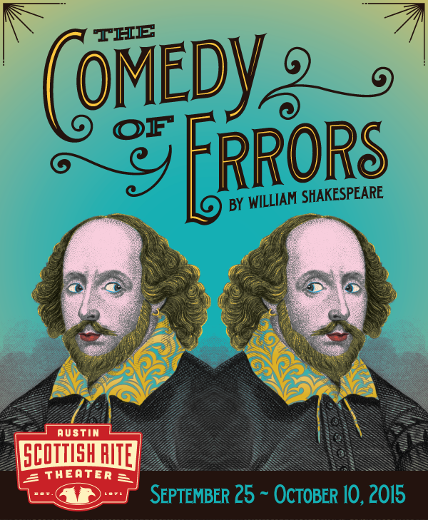 Austin’s Scottish Rite Theater is Austin’s oldest theater and is now showing A Long Winter’s Night. 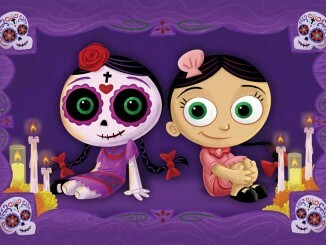 The main character is Little Suzi and her dad, friends and fellow creatures perform in an adventurous setting. They even bring a neighborhood marching band, too. How cool is that? They have some cool songs written by the director, Laura Freeman. 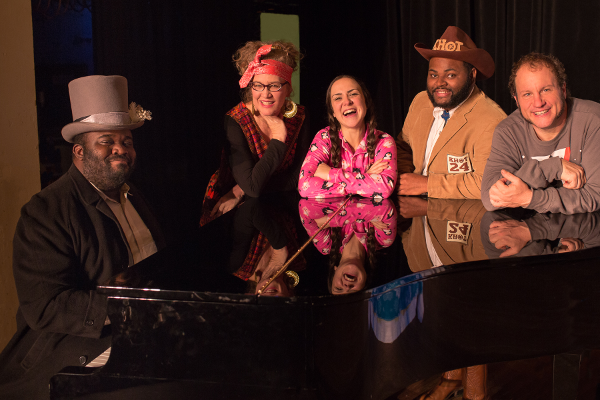 At the end, you can buy Laura Freeman’s CD’s for $10 each and get autographs from all of the characters and pianist! Cozy seating is available on the floor on rugs, and they even have coloring pages with crayons. They have a lot more shows coming up so plan on coming to see them. Tip: The theater has a large floor space set up in front of the stage, allowing kids and their parents to sit on the floor. For best snow flake catching, I recommend sitting either on the floor or grabbing seats near the front on the left or right side. And don’t tell your kids that there is snow. The surprise is well worth it! Tickets: $12 + service fees for ages 13 and older; $8+ service fees for children under 12. Purchase tickets here. 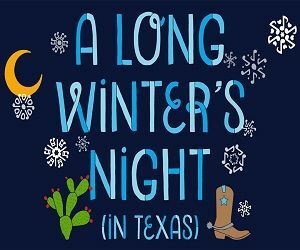 Giveaway: One lucky winner will receive a Family Four Pack of tickets to see A Long Winter’s Night (in Texas)! The tickets are valid for the the following dates and times: December 12, 13 and 19 at 11 am and 1 pm. Total value is approximately $40. What do you have to do to win? Leave a comment or complete the form below. One lucky winner will be chosen randomly. The winner will be contacted via email with 24 hours to respond to claim the prize. If no response is received within 24 hours, a new winner will be chosen. All entries must be received by 9:00 a.m. CST on Wednesday, December 9, 2015.You must be at least 18 years or older to enter. The prize holds no cash value and cannot be redeemed for other merchandise. Official Rules.